Oh man. I don’t want to admit I’ve finished reading this. Mostly because I want to just pick it up and start reading it again from the beginning. I’d heard, from people whose judgment I trust, that this was a wonderful book. But I kept not reading it. I think it was the oddness of it, the way it doesn’t really fit into any category. It’s ostensibly a cookbook, written by an Episcopalian priest. It calls itself “a culinary reflection.” There is poetry. The first chapter, he asks you to study an onion. I still don’t know for certain whether or not we discussed all the recipes promised. But I was delighted by this man, by his views of food and life, frugality and fasting. My favorite furniture set-up in our current house is when there is a couch in the dining room (which is open to the kitchen), specifically so you can sit comfortably on a couch while someone is prepping/cooking/cleaning in the kitchen. 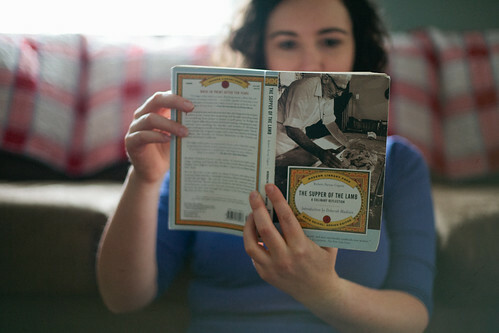 Reading this book felt like sitting on a couch while a dear friend did work in our kitchen. He’s such a good host that I suspect he was sneaking me drinks and snacks while cooking, or inviting me over to the counter so he could show me the interesting pattern made by the boiling of the water. Basically, everyone has to read this book now. Just accept your fate. If, for some reason, you hate the book, I’ll buy it from you so I can give it to someone else.